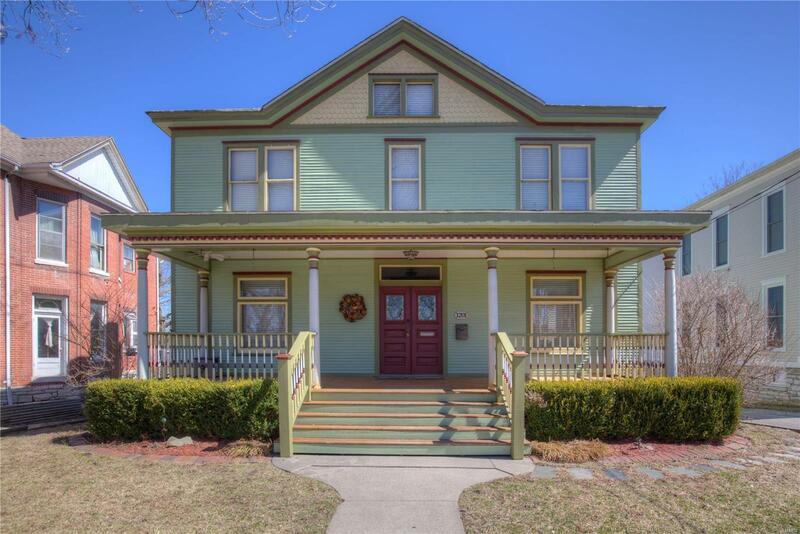 REGAL AND LOVELY, THIS HISTORIC ALTON HOUSE IS READY FOR YOU TO MAKE IT YOUR NEW HOME! BUILT IN 1900, THIS HOME HAS BEEN LOVINGLY RESTORED AND UPDATED, EVERYTHING HAS BEEN TOUCHED. GORGEOUS HARDWOOD FLOORS AND TRIM HAVE BEEN BROUGHT BACK TO THEIR ORIGINAL SPLENDOR. LARGE LIVING ROOM HAS BUILT-INS FOR YOUR LIBRARY. THE EAT IN KITCHEN HAS STAINLESS STEEL APPLIANCES, A LARGE PANTRY AND AN ADORABLE BREAKFAST NOOK. BEAUTIFUL ORIGINAL STAIRCASE LEADS TO THE SECOND FLOOR. UPSTAIRS, THERE ARE THREE NICE SIZED BEDROOMS AND TWO FULL BATHS. LAUNDRY IS ON THE SECOND FLOOR. THE 3RD FLOOR ATTIC IS DRYWALLED AND PERFECT FOR ALL YOUR STORAGE NEEDS. MORE STORAGE IN THE WALK OUT BASEMENT. NICE ELEVATED DECK FOR ALL OF YOUR SUMMER ENTERTAINING! LARGE COVERED FRONT PORCH! NEW CONCRETE PARKING PADS AND VINYL FENCING. WALK IN AND FALL IN LOVE WITH THIS PIECE OF ALTON'S HISTORY!